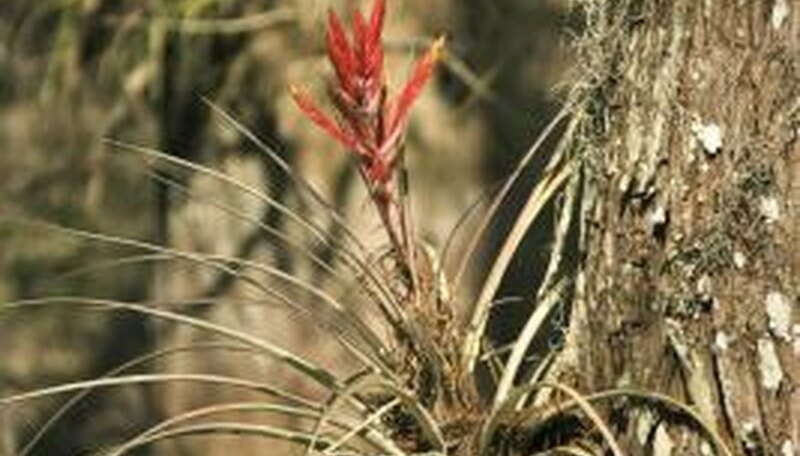 Certain bromeliads develop hold-fast roots to attach to trees or rocks. Epiphytes, also known as "air plants," often grow wild on the bark of trees. Bromeliads you can mount on driftwood include Billbergia, aechmea, and Tillandsias that have hard leaves. Many bromeliads need to be potted, so it's important to choose bromeliads that can thrive in a mounted setting to avoid disappointment. Mounting a bromeliad on driftwood requires only a few common supplies. Submerge the driftwood in a bucket of water to soak out the salt. Change the water at least every two days for two weeks. Dry the driftwood in the sun for a day. Match each bromeliad to a suitable piece of driftwood so that the plant's roots will have sufficient support. A small tillandsia can nestle in a piece of driftwood the size of your hand. A larger bromeliad requires a piece of wood at least the size of the plant. Driftwood with holes and deep crannies work well for mounting bromeliads. Wrap sphagnum moss around the roots of each bromeliad. Use enough to cover the roots, such as half a handful. On a small plant, a thumb-sized amount of moss is enough. Situate the plant's moss-wrapped roots in a depression or cleft in the driftwood. Wind fishing line gently around the base of the bromeliad and the driftwood, wrapping the two together. Wrap the line securely around the plant at the juncture of the leaves and the roots and around the driftwood six to eight times until the plant is securely attached. Leave at least 2 inches of line free and tie the starting end and the end of the line together. The wrapping is only temporary for support, so you don't have to be concerned about the kind of knot or how it looks. Cut off the nylon string once the bromeliad roots are firmly attached to the driftwood, after a month or longer, depending on the species and maturity of the plant. Mountable bromeliads, including Tillandsia, Aechmea and Billbergia, use their roots primarily for support. They take in water and nutrients from the air, dust and debris in their environment. Avoid overwatering your driftwood-mounted bromeliad, as this can cause rot. Use rainwater or distilled water for tank-style bromeliads. Tank-style bromeliads form a natural cup in the center of the leaves. Water them by pouring the water into the cup. Bromeliads prefer at least 50 percent humidity. Keeping bromeliads in the bathroom or kitchen can help them thrive in homes with heated, dry air. Tillandsias with gray or hard leaves are epiphytes. Other tillandsias with soft leaves prefer being potted. Mist driftwood-mounted bromeliads to supply them with water and place them in bright, indirect light. Check that the bromeliad is securely attached to the driftwood before moving it to avoid injury to the plant. Avoid placing bromeliads in direct light or full sun.